With Big Band Drumming at First Sight, Steve Fidyk offers a comprehensive approach to improve sight-reading skills in a big band setting. With advice on how to accompany different musical forms and playing styles, Fidyk gives detailed information that will strengthen your ability to recognize band figures and beat patterns quickly and easily. The companion play-along MP3 CD features 10 arrangements of varying style with beat and figure examples extracted from each score that are "looped" or repeated several times for thorough study. 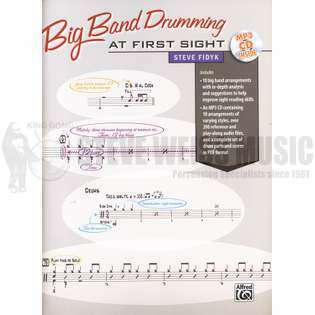 Big Band Drumming at First Sight will be an invaluable tool in helping you to become a better sight-reader! Read, listen, study, and learn through Steve's experience on what it takes to look at a drumset part once, and know how to deliver the musical goods with confidence!